I sat on the edge of the sailboat with my rubber flippers hanging off the ladder. The goggles sucked tight to my face. The flippers pinched the top of my toes. I glided into the water hands first, and dove down toward the reef. 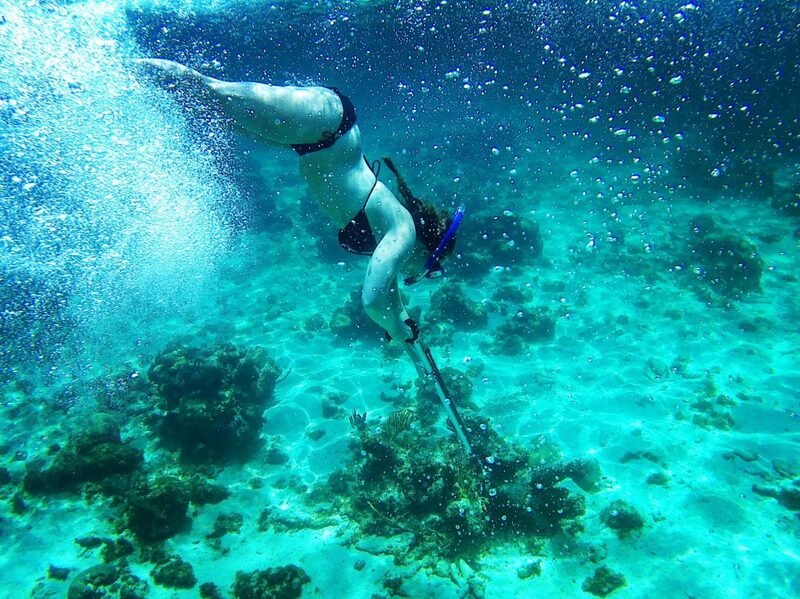 It was the third day of our vacation in Belize, and the day-long sailing excursion would take us snorkeling in the reef, swimming with nurse sharks, and spear fishing. “Will the sharks be dangerous?” I asked one of the reps making our excursion arrangements. Back in the water, bubbles tickled my legs as one-by-one the other passengers jumped off the sailboat. The guide, Rio, swam several spaces ahead of where the crowd entered the water. Six guests on the excursion, and four others were manning the sail boat. The water was several shades of blue. The reef’s surface was speckled with bright colored fish. Some were black, blue, yellow, and orange. They were striped, spotted, and rainbow-colored. A spear gun shot underwater sounds a lot like a rubber band snapping. It’s like the electric shock of two fingertips touching that only those who are shocked can hear. A long, narrow fish sank down toward the ocean bottom. Light penetrated the waves and cast drifting shadows across the reef. Rio swam down and grabbed the rope, pulling the fish along with the spear. I pointed to the surface and Rio followed me. “That’s a barracuda.” I said. I looked down at the barracuda’s face. Its narrow body was the size of my arm from fist to shoulder. It had two large eyes; one on each side of its head. Several long, sharp teeth protruded from its mouth. I once read a news story about someone attacked by a barracuda. A couple were kayaking off the Florida Keys. A barracuda projected out of the water at what they estimated to be 50 miles-per-hour, hitting the woman so hard it broke her ribs and collapsed a lung. I developed a new phobia after reading that story, and looking up pictures of its menacing eyes and monster-sharp teeth. The descriptions of their attack strategies weren’t too pretty, either. I watched Rio take the spear and force the tip through the barracuda’s skull. He then pierced the side of its stomach so that the fish was strung on a rope attached to a life buoy. 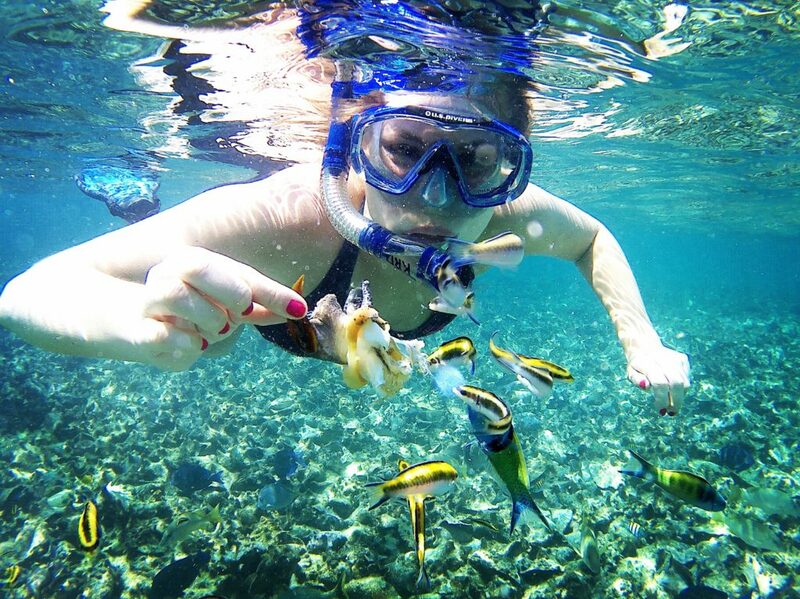 “Aren’t they attracted to shiny objects?” I pointed to my sparkly nail polish and the sequins on my bikini. Looking back, I don’t know why I had this much trust in our safety. Perhaps it was because the other passengers continued to hang over floatation devices, with their bottoms up out of the water, kicking their flippers, and pointing at coral. Perhaps there was no real threat. After all, the crew never discussed the possibility of an accident, and what we should do if anything were to go wrong. What could go wrong? The guide did this every day. So far, he hasn’t been bit in the jugular. I emptied the goggles of salty water, and eased my head back under the surface careful not to splash water into my snorkel. Rio was with the other swimmers. He was a few dozen yards away and pointing to a cave underneath the reef. Its opening was large enough to house a sea monster. The entrance was probably 30 feet below the surface, and was as dark as a blackhole. Rio entered it. I was in the back of the group, watching for Rio to return from inside the cave, when something caught the corner of my eye. A sizeable fish swam ten to fifteen yards away to my right. It’s long body slid through the water like a submarine. A dark pupil moved back and forth across the white of its eye. Then the dark pupil of the eye stopped. The barracuda watched me as it glided by, curving its body just enough to circle around me. Deciding, contemplating, scheming. My bright pink nail polish shimmered in the sunlight. I clutched my hands into fists, burying the top of my fingers into my palm. There was nothing I could do about the sequins stitched on my swim suit. Another had joined the first. Two eyes were on me. The sailboat was several hundred yards away. Rio returned from the cave, but wasn’t watching me. My only defense was the spear gun. I would have several life-threatening bites by the time anyone reacted post-attack. I imagined blood infiltrating the water like a thick ink. I didn’t make quick movements, but attempted to glide closer to the crowd. Rio and his spear gun were closer than the sailboat. I dug my fingers into my palms. Can barracudas smell fear? Can they hear a pounding heart? I waited for Rio’s attention, pointed above, and poked up my head above the water surface. He followed. I spit salty water out of my mouth. He looked underwater and popped his head back up. “They do that.” He said. I ducked my head underwater and searched around me. I couldn’t see the barracudas. What was I going to do? Miss this amazing experience? Swim to the sailboat, get out, take off my goggles and flippers and sit there above the second greatest barrier reef in the world? Swimming with barracudas wasn’t something I planned. It wasn’t like I decided to face this specific fear during my 30th birthday trip. But, I’m glad it happened. It couldn’t have been more perfect. It made me realize how many fears are thrust upon us. We fear something for so long. We imagine how horrible it would be to face it; for it to come true. It’s the thing of our nightmares that wakes us up in a hot sweat and shallow breathing. But then one day, when we’re somewhere or with someone we’d never expect this fear to materialize, it’s suddenly facing us. It’s just beyond arm’s reach. This cancer, bankruptcy, shark, divorce, death, failure or <insert any fear> is close enough it could stretch out and touch us. But, that’s the beauty in fear. Because so often, once we’re facing fear straight on, we see that we’re not as scared or controlled by it as we thought we’d be. We just keep swimming. We just keep doing our thing. And, sometimes, it doesn’t touch us. And the experience ends up being one of the best in our lives. 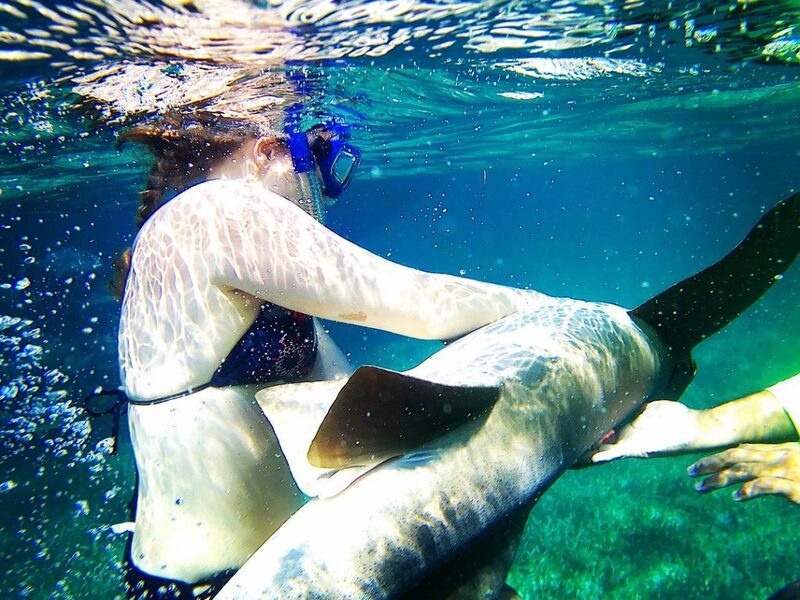 If I hadn’t mustered enough courage to stay in the water, I would’ve missed all these other experiences. 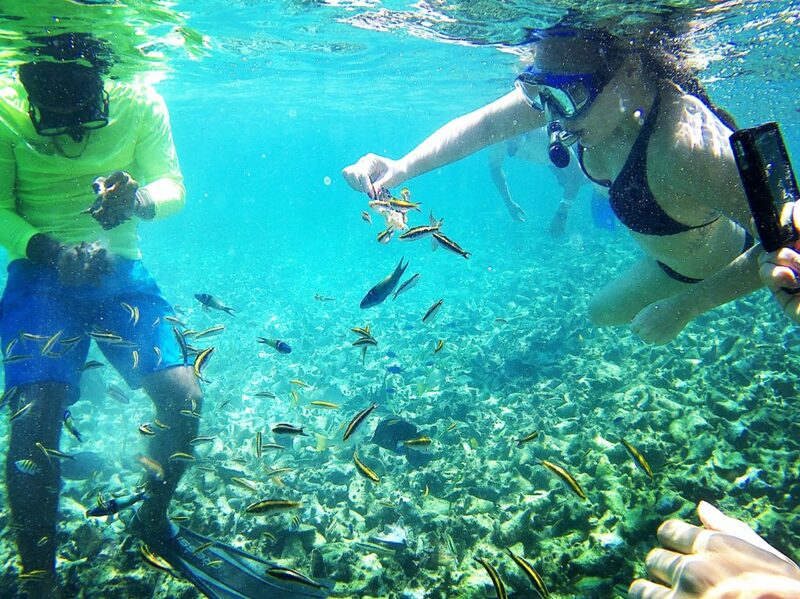 See more from our underwater Caribbean adventure below. Possibly my new favorite sport: spear fishing! I actually spared one fish. I think it’s always good to know how to find and prepare food. Now I feel extra prepared with knowing how to use this spear gun. We did eat the fish we caught. The sail boat included a full kitchen and a chef. One of the best lunches I’ve had. This is a man-made underwater island of sea shells. A sailor (I can’t recall his name) brings sea shells to this one area of the reef. It’s becoming a type of crustacean graveyard. The pictures don’t do it justice. Rio took two shells and gently pounded one against the other, until something white and fragile looking came out. “Take a bite.” He told me. It was a sweet, chewy texture that reminded me of squid. We fed the remainder of the meat to the fish. 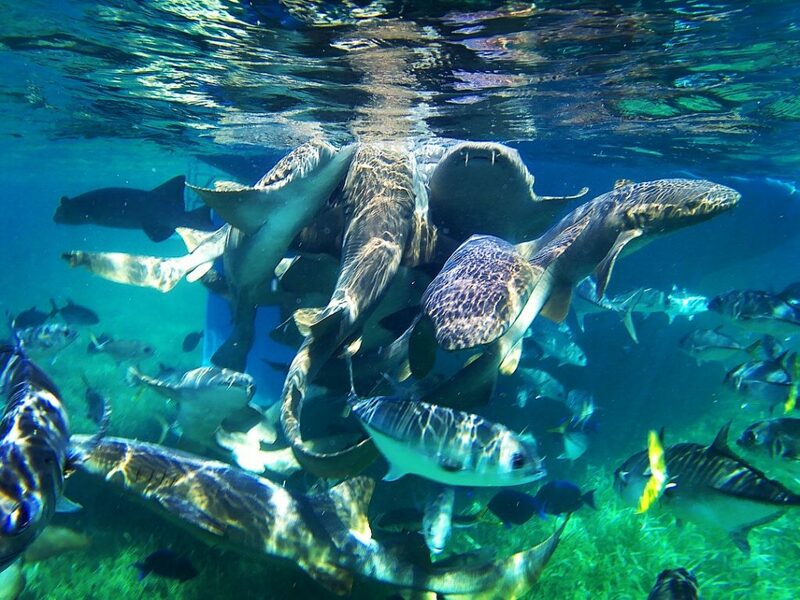 Rio and the crew threw chum into the water to attract the nurse sharks. Some sharks were as long as ten feet! These large animals are docile and beautiful. We let them eat, then Rio found one and quickly but gently rolled it on its side. The shark rest in his open arms. He guided my hand over the shark’s belly before handing it to me. In case you’re wondering, the underbelly of a nurse shark feels like rough sand. The sensation of her breath under my hand was one of the most exhilarating experiences I’ve ever had. I’m ready to plan the next sailing trip!